2016 gave us the P9 Plus. This year, we get the P10 Plus. With its 5.5-inch size, it turns out to be larger than its younger brother, the Huawei P10. It also differs from the smaller model in the design of the main camera, faster 4G LTE connectivity and its availability in an exclusive color. In addition, its front camera features auto focus. In our hands-on review, we present this device in more detail. Here are our first impressions. The P10 Plus will be priced at €699 and €799, for the 64 GB (with 4 GB RAM) and 128 GB (with 6 GB of RAM) versions. Huawei hasn't announced that the devices will come to the US, but these prices are equivalent to $740 and $845 for the P10 Plus. 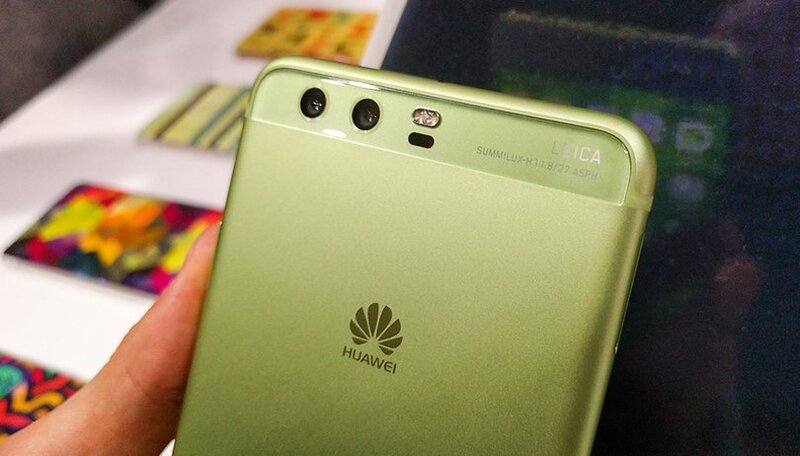 In terms of colors, Huawei has improved on the variety options it usually has and the P10 Plus will be available in Graphite Black, Mystic Silver, Dazzling Gold, Dazzling Blue and a new light green variant called Greenery, which is the Pantone Color Institute's color of the year for 2017. It's expected to cost around $750 once it is released. Just like on the P10, the fingerprint reader is located in the front. Other than this, the design of the P10 Plus is more or less the same as what you find on the P9 Plus. The main difference in this respect is the use of Hyper Diamond Cut finishing, which is a first for a Huawei device. The Hyper Diamond Cut finish will be available in the colors Dazzling Blue and Prestige Gold. Mystic Silver, Graphite Black and the latest color edition, Greenery, will have a sandblasted finish. This new model showcases a new build technology in which the surface of the device is polished ten times. This makes it reflect beautifully, showing off a pattern of many small triangles. The back camera has a slightly rough feel to it. With Gorilla Glass 5 protection, Huawei protects both the screen and the camera lens from bumps and scratches. A drop of 1.8 m should not damage the glass. However, the coloration of the anodized aluminum will disappear over time. Despite the Nano-Coating protection that guards the device from water, Huawei ignores IP certification for the P10. The manufacturer therefore consciously falls behind the competition. The iPhone 7, Samsung Galaxy S7 and the Sony Xperia XZ all offer IP67 certification or higher. The Huawei P10 Plus's 5.5-inch screen is an IPS panel with WQHD resolution (2,560 X 1,440 pixels) resulting in 540 ppi. Compared to the P9 Plus, Huawei has not only increased the resolution, but presents a different technology, which makes it possible to use the phone with a virtual reality glasses, but not provided by Huawei. If you want to embark on the Daydream adventure, it is better to opt for a Lenovo Moto Z or a Google Pixel. The P9 Plus continues to dominate in one particular technological aspect: PressTouch (also known as Force Touch or 3D Touch). The P10 Plus has given up the tactile sensitivity that allowed it to register several different levels of pressure. The reason may be that on native Android there is a similar feature in the form of Quick Shortcuts or fast shortcuts that would render Huawei's solution obsolete. EMUI 5.1 is an optimized version of the interface we found up to now on Huawei devices, built on Android 7.0 Nougat. On this P10, the difference with the Mate 9 is simply that the camera app is improved and a new GoPro gallery application is added. "Optimized" means that EMUI analyzes your use of the device, and aims to offer you the applications that you desire at the time you want. In the long term, this allows for good performance. You will find in our tips and tricks article for the Mate 9 that several software elements are the same as that of the P10 Plus. In our final review, we will be interested in testing all the features of the software interface. We will also look in more detail at the GoPro gallery which is supposed to create videos for social networks from content, as does the iOS photo app. Theoretically, the performance of the P10 Plus should be quite similar to that of the Mate 9. The Mate 9 currently leads our ranking of the best performing smartphones and, compared to the other devices of 2016, it seems to be the fastest. Will the Mate 9 maintain its lead against the P10 Plus? With regard to gaming performance, the combination of the Kirin 960 with the Vulkan API allows smooth gameplay. The graphics are powered by a Mali G71 MP8 chip. So, unlike the Huawei P9 Plus, we can recommend the P10 Plus to all the gamers. The antennas have also been improved, and the 4G capability now doubles the maximum speed. In the case of the P10 Plus, it uses a 4 x 4 MIMO (multiple-input and multiple-output) connection, so as a result more connections are possible than with the smaller P10. The WiFi, on the other hand, uses MIMO 2 x 2 and is compatible with standards up to 802.11ac. Unfortunately, the 11ad is not supported. Bluetooth is supported up to version 4.2. Additionally, the P10 also includes an IR blaster. Plastic headphones come as standard issue with the P10 Plus. On the unit itself there are stereo speakers that have exactly the same configuration as the Mate 9, i.e. mono when you hold the device vertically and stereo when holding it horizontally. There is no special Mate 9-style microphone to reduce noise, so we're only expect average quality here. The Huawei P10 Plus has a larger camera configuration than the Mate 9. The combination of a 20 MP black-and-white lens with a 12 MP dual-camera color lens is ever present, and has been improved with a Leica Summilux which allows for an f / 1.8 aperture. On the front, we have an 8 MP camera with, for the first time ever, Leica autofocus. At the front, the aperture is f / 1.9. Group selfie enthusiasts will be pleased to find a mode that improves angles. The inclusion of an autosensing algorithm will be allow the camera app to detect changes in the light and adapt your images to the conditions, and can now detect whether you are taking a selfie or a group picture. For a group picture, the phone should jump directly into wide angle mode. It has been further optimized for faces and now includes 3D face recognition technology, which evaluates 130 unique identification points to be faster and more accurate in capturing your selfies. The popular beauty mode has also been given an upgrade to accommodate more facial features and different skin tones. The P9 Plus's 3,200 mAh battery is increased to 3,750 mAh for the P10 Plus. Does it really affect the battery life? We will see this in our final test. With Huawei SuperCharge, the charging time should be reduced. After only five minutes of recharging using the proprietary cable, the P10 Plus should be able to withstand at least two hours of moderate use, including watching videos. The phone can be fully charged within around 90 minutes. The phone is charged via USB Type-C, but unfortunately only transfers data with USB 2.0. The P10 Plus offers an obvious added value compared to its predecessor and its younger brother, the P10. We were able to see that the camera can take pictures more vivid and rich in detail thanks to the new stabilization and software improvements. 4G performance has been improved through antenna optimization as well. In our full review, we'll look at whether the price difference between the two models is justified by the benefits promised by the P10 Plus. Here, Huawei shows that its P range is really for everyone and is ready to knock Samsung off its pedestal. The battery life is one of the reasons I prefer Huawei than other phones, and I'm using Mate 8 which is great with long battery life, I love it. The Huawei P10 Plus is actually very good but again why do they still use the LCD displays because their competitors have way better displays. Yes Andrew, it is exactly what do they do now I think. Curious to know the real world battery life.